Behind the disarray is a carefully-deployed packing strategy. I started packing when I was 11 years old, and I never really stopped. Ten years later, I’m still going strong. No longer limited to traveling between my parents’ houses, now I pack to go to and from college, short trips to Kansas City, longer trips to Israel, summer internships, and my hastily approaching training session in New York City that starts tomorrow. You could say I’ve become pretty experienced at this point. Sure, I had a rough start — forgetfulness often ensued in my journeys from Schaumburg to Streamwood as a fourth-grader — and I’m still a compulsive over-packer. Packing has been a constant irritant activity in my life. And I like to think I’ve come across some tips as I’ve packed my way through adolescence into adulthood. Stop, fold and roll: If your mom is anything like mine, she doesn’t care much about whether clothes are perfectly folded. Luckily, that mindset has transitioned well into packing suitcases. Contrary to popular belief, folding takes up too much space. You can fit more clothes (and more of everything, really) if you roll them instead. There is a sacrifice to be made in the area of wrinkles, but really, I’ll put up with that if I can bring two more pairs of jeans. Sometimes, simpler is better: I love various accoutrements from The Container Store as much as the next person. But I’ve learned not to discount the ever-useful trash bag and roll of packing tape. Bags, rather than bins, of clothes can be shoved between front and back seats. Packing tape easily transforms unruly hangers into a clean stack. As I’m sure we’ve all learned, they don’t seem to fit well in any bag or box. Oh, the lessons you learn when packing many of your worldly possessions into a small Saturn to make a seven-hour drive home from Missouri. Treat it like Tetris: Moving heavy bins and bags up two flights of stairs by yourself is not fun. It is even less fun in 85-degree heat. But, the one redeeming factor of car-packing is its similarity to the beloved childhood video game, Tetris. Your backseat, a blank screen. The boxes and bags, various brightly colored cubes. The only thing missing is the annoying music. Longish space in back? Perfect for a stack of drawers. Small squarish space on the floor? Coffee maker has a temporary home. It’s all fun and games, until you realize you can’t see out your back window. Game over. You don’t become an expert packer over night. As transient as I am, I’m still experimenting with the best duffel-bag-and-trash-bag combo and how to most efficiently use the space in my car. I’m also learning how to fend for myself, in a way. I rented a storage space, moved myself out by myself and will move myself in again next month when I move to Cleveland. I can’t say I look forward to every packing adventure, but with each move, I have to grow up a little more. With every move, I have to consider what I have, what I need and what I can live without. Sometimes, the move signals a shift to a new city and a new state. I keep telling myself that It’s all part of a reporter’s life, which I’m edging toward summer by summer. 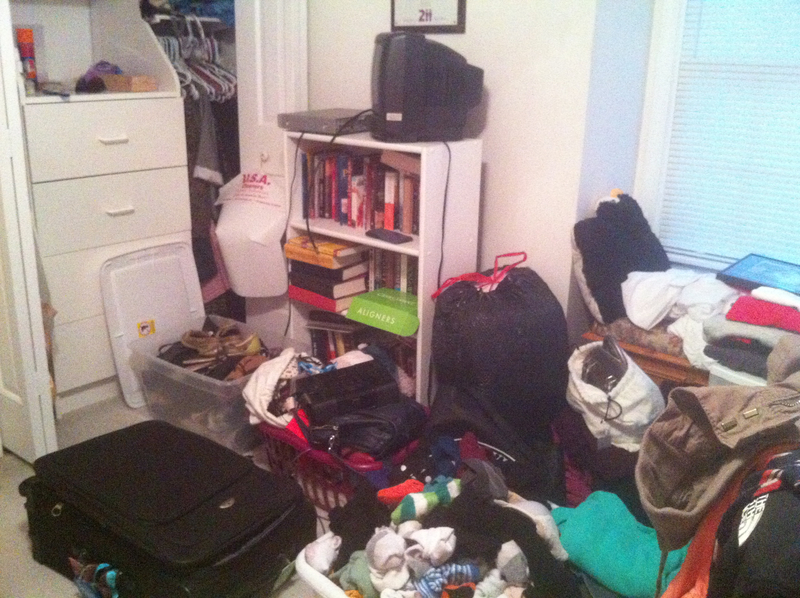 Fortunately for me, I get to pack and unpack all of my stuff as least six more times…this summer. This entry was posted in Internships. Bookmark the permalink.